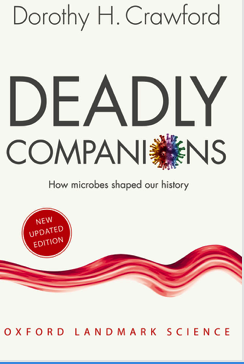 I recently read a book that somehow escaped my attention when it was first released 11 years ago: Deadly Companions: How Microbes Shaped Our History. This book, by the University of Edinburgh's microbiology professor Dorothy Crawford, was just released in an updated edition. To someone like me who is completely obsessed with this subject, I increasingly approach books in this genre with a bit of apprehension because the value-added aspect of each additional books is less and less. However, Deadly Companions is a book which I found valuable. The book consists of 8 chapters plus a preface, introduction, and conclusion. Chapters are not organized around specific microbes, but forces that propel microbes to cause epidemics and disease such as crowding and famine; other chapters are devoted to explaining the dominance of microbial life on this planet. I recommend Deadly Companions for a short and enlightened -- but still comprehensive -- overview of infectious diseases of the past, present, and future.